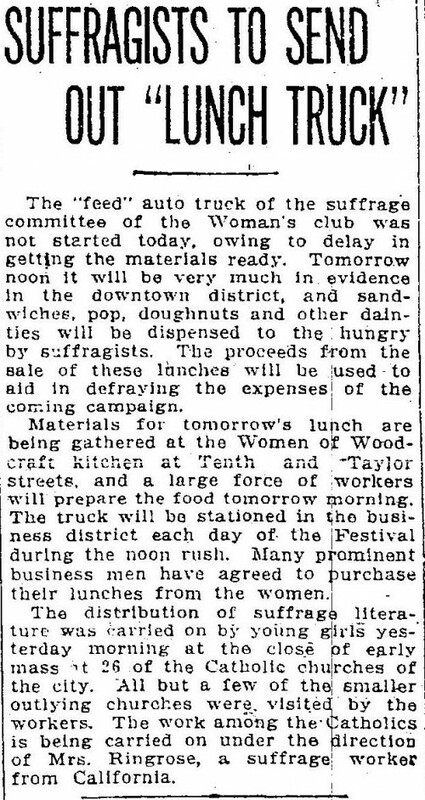 The “feed” auto truck of the suffrage committee of the Woman’s club was not started today, owing to delay in getting the materials ready. Tomorrow noon it will be very much in evidence in the downtown district, and sandwiches, pop, doughnuts and other dainties will be dispensed to the hungry by suffragists. The proceeds from the sale of these lunches will be used to aid in defraying the expenses of the coming campaign. Materials for tomorrow’s lunch are being gathered at the Women of Woodcraft kitchen at Tenth and Taylor streets, and a large force of workers will prepare the food tomorrow morning. The truck will be stationed in the business district each day of the Festival during the noon rush. Many prominent business men have agreed to purchase their lunches from the women. The distribution of suffrage literature was carried on by young girls yesterday morning at the close of early mass at 26 of the Catholic churches of the city. All but a few of the smaller outlying churches were visited by the workers. The work among the Catholics is being carried on under the direction of Mrs. Ringrose, a suffrage worker from California.